Gulfport Energy’s Southern Louisiana assets are 100% owned and operated. The West Cote Blanche Bay overlies one of the largest salt dome structures on the Gulf Coast and is located approximately five miles off the coast of Louisiana in a shallow bay with water depths averaging eight to ten feet. The Hackberry field is a major salt intrusive feature, elliptical in shape as opposed to a classic “dome,” divided into east and west field and located along shore and the land surrounding Lake Calcasieu, 15 miles from the Gulf of Mexico. "Gulfport's Southern Louisiana assets continue to provide a strong base of cash flows for the company and allow us to then redeploy this capital for resource play expansion." Gulfport’s Southern Louisiana assets include its West Cote Blanche Bay and Hackberry fields. 2018 year end net proved reserves totaled ~2.5 MMBoe. Gulfport currently has ~10,816 acres under lease in Southern Louisiana. During the fourth quarter of 2018, production in Southern Louisiana averaged approximately 1,754 Boepd and ~1% of Gulfport’s total production. 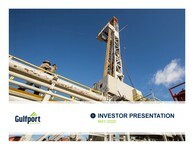 Gulfport’s Southern Louisiana production is high-quality Louisiana sweet crude and priced at a premium to WTI.